Nothing beats the feeling of driving up to an amusement park and seeing all the rides you’ve been looking forward to riding from the parking lot. Well, things are a bit different for Universal, but the feeling is just as great – if not better. Walking down Universal’s CityWalk, you can see the green curls of the Incredible Hulk Coaster, the tower of Hollywood Rip, Ride, and Rockit, and … something new. There’s a castle rising from next to the Jurassic Park Discovery Center – it’s Hogwarts Castle. I decided to save The Wizarding World of Harry Potter for last on my first go-round of Islands of Adventure during my week-long vacation. I’m a fan of the books of movies – not a diehard fan, but I enjoy them very much. Let me just say – walking through the gates of Hogsmeade was like entering a whole new world. Videos and pictures don’t do the area justice – I’d even say it looks awkward in pictures. When you actually walk in, it looks incredible. When you compare it to shots in the film Harry Potter and the Prisoner of Azkaban, Universal was really spot-on in constructing the area. All of the stores from the movies are there – and the area is filled with hidden details that I really had to notice during the whole week I was at Universal. But this isn’t the reason people were lining up an hour before the park opened at the Islands of Adventure gates. They were here to ride Harry Potter and the Forbidden Journey. 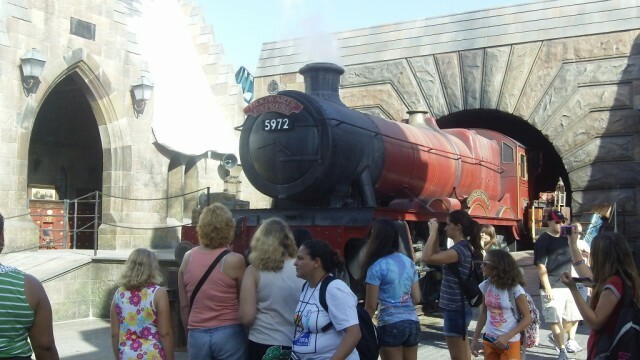 The Hogwarts Express greets visitors as they enter the area. There’s good news and bad news when it comes to the queue line – the line. The bad news is that you spend roughly the first 75% of your waiting either outside or in the green house, and it’s boiling hot in there. The theming is minimal (since the greenhouse in the movie doesn’t really have that much, and this serves as the main turnstile area), but the line moves very quickly. Then comes the good news – the last 25% of the ride is the new “best queue line ever”, now that Dueling Dragons, that is – Dragon Challenge, has removed most of the theming that made its original line amazing. First, you see a statue featured in the film Harry Potter and the Chamber of Secrets, then you see the house jewels (guess which house is winning), and of course you see the entrance to Dumbledore’s office. Next, you walk past several talking portraits (one of some sort of alchemist, and some wizards watching Quidditch), before entering the main Portrait room with the changing stairs, where the founders of Hogwarts quarrel above your heads, and talk about the Muggles entering the school. Finally, you enter Dumbledore’s office, where Dumbledore talks to you about your approaching 3 hour lecture on the History of Hogwarts by Professor Binns. However, you enter the Defense Against the Dark Arts classroom where Binns hasn’t arrived yet, but Harry, Ron, and Hermione warn you about the boringness of the lecture and decide to whisk you away using Flying Benches. 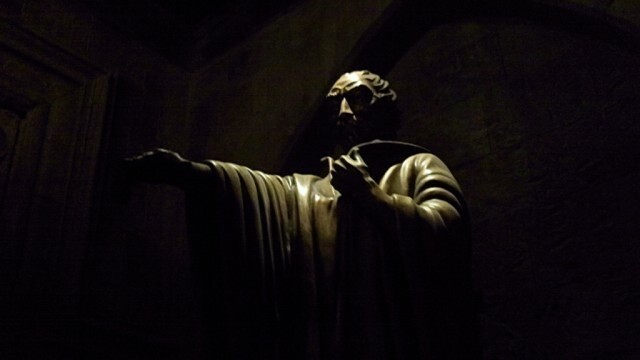 A statue featured in Harry Potter and the Chamber of Secrets. Next, you enter the Gryfindoor commonroom where some other portraits explain the dynamics of the ride, and you also pass the Fat Lady who sings and says unimportant stuff to you. The last portion of the ride’s queue line brings you to an excellent Sorting Hat animatronic who tells you some more technical information about the ride, before a ride attendant (dressed in Hogwarts robes, of course) helps you and your family into one of the rapidly moving vehicles … wait. This is an Omnimover?? Yes. Of course, it’s the robot arm technology – but tons of cars are rapidly coming in and out of the station. There’s a constant flow of these arms, which means the ride never stops moving, granted of course it’s not broken down. So, that means if you waited 90 minutes – there must be a TON of people in front of you waiting to get on. Think about it, if there was no pre-show, Haunted Mansion would never have a wait. That’s a comparison. I thought the ride stopped, you boarded, and then it started again, like Spiderman. No wonder the line moves quickly. The thing is, you just don’t get anywhere. So, when you board, you get your shoulder harness pulled down, and you’re off. The Harry Potter theme plays as Hermione uses floo powder to whisk you off on an amazing adventure. The ride uses a creative combination of animatronics and video screens. When you’re in front of the video screens, fans blow wind in front of you as if you’re really flying. Suddenly, you’re in a live set and stuff is happening right in your face – and I mean it. The ride vehicles, the robot arms, are capable of getting you closer to the sets than in Haunted Mansion or other dark rides. I won’t give anything away – but a bunch of “characters” from the Harry Potter books and films are flung in your face in a manner that’s really amazing. You’re sad the ride is over, and you realize the 90 minute wait was COMPLETELY worth it. I’d give this ride 10.0 rides out of 10, without a doubt. I can’t decide whether I like this ride or The Amazing Adventures of Spiderman better, so for now I’ll give them both the double-thumbs-up. Universal’s constant use of cutting-edge technology is really creative and amazing, unlike some of the other amusement parks in the area. 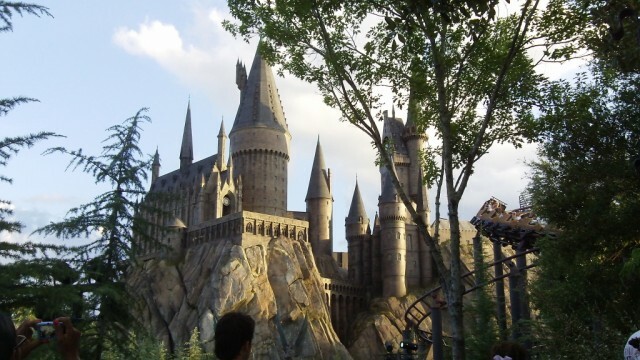 Visiting this area, trying pumpkin juice and butterbeer, and riding these rides is all worth the day-trip to Islands of Adventure, and a full week can be easily spent at Universal. Here’s a tip – the single riders line for this ride moves a lot quicker than the normal line, and you even get a quick glimpse in the castle – but make sure you walk through the real line at least once during your vacation. This ride has a whole new kind of magic – and it must be experienced. It’s a shoe-in for Best New Attraction and Best Dark Ride in this year’s Golden Ticket Awards. Fantastic review Austin! Welcome to the team! The story of the ride is all over the place. Journey?? You barley leave the Castle and they throw everything in. The Spiders and the Dragon the game and the ghosts. At the end. Why are they cheering and congratulating you?? It’s not like the patrons saved the school because Harry Potter destroys those Demetors himself. HOORAY patrons. cheer for the riders for doing nothing and saving no one in the ride for we had to do it our selves. HOORAY for you. It’s a lame story. But it is a fun ride.